Blue dots on the left side identify unread topics, and dark black arrows on the right side indicate topics that apply to the current design. Lighter gray arrows (not shown here) indicate topics that apply to another design of the current page. You can use the controls in the toolbar above the listing to filter and sort the list of topics, and search for specific text in the body of a topic. 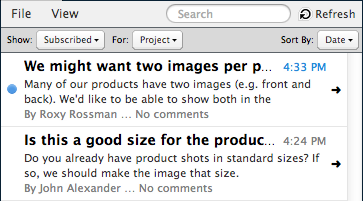 Normally, ProtoShare only shows the pushpin for the selected topic (except when adding new topics). 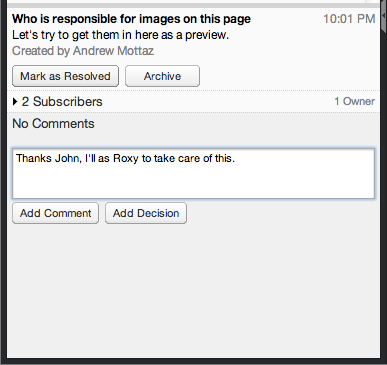 You can reveal all of the topics for the current design using the button in the toolbar above the viewing area.